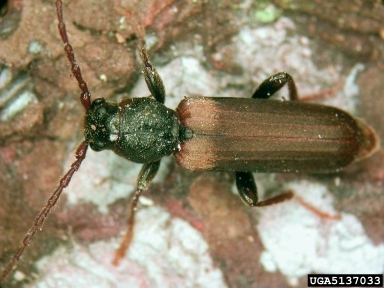 Brown spruce longhorn beetle (Tetropium fuscum) (BSLB) is native to north and central Europe and western Siberia. 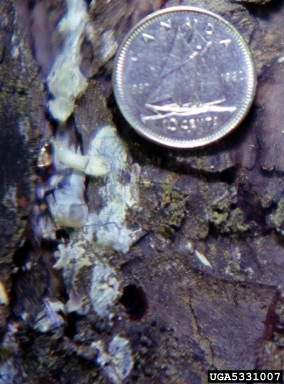 It was first detected in Canada 1999 in Point Pleasant Park in Halifax, Nova Scotia, but likely arrived 10 years or more before that in solid wood packaging material. It is of concern because it can kill healthy trees, though prefers those that are already stressed. Though it spreads slowly, there is a risk of the beetle's range expanding in to other areas of Canada. 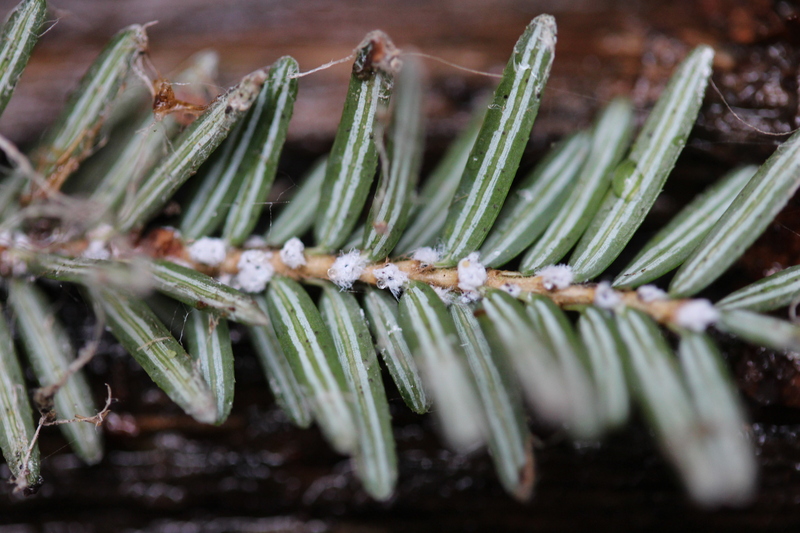 The Canadian Food Inspection Agency is working to slow the spread of the beetle by restricting movement of spruce products from the infested area. 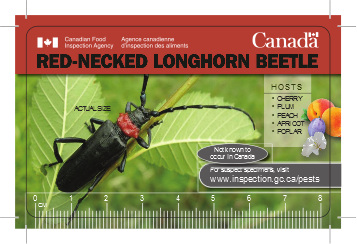 See more about brown spruce long-horned beetle in Canada. 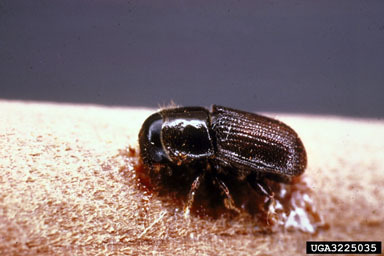 In its Canadian range, adult beetles emerge from spruce trees from late May to mid-August. 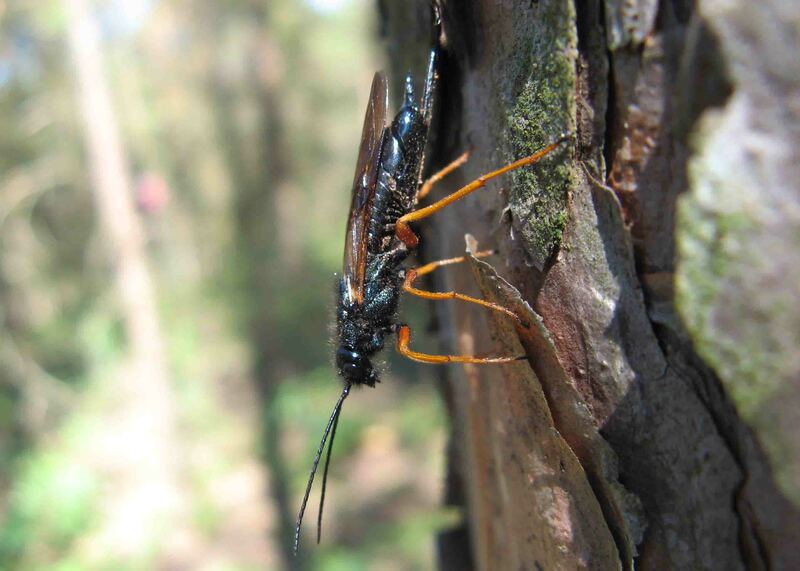 The female lays eggs in crevices in the bark, and larvae hatch about 12 days later. Newly emerged larvae bore through the tree's bark to the inner bark layer (phloem) where they feed, creating irregular feeding galleries. 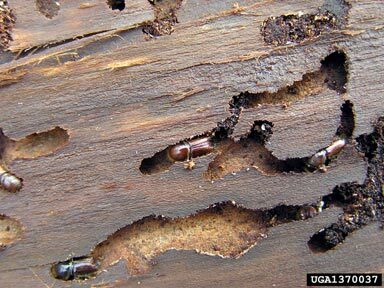 In the fall they excavate pupal chambers either in the interface between the inner bark and the sapwood, or in the sapwood (up to 4 cm deep); they pupate the following spring. 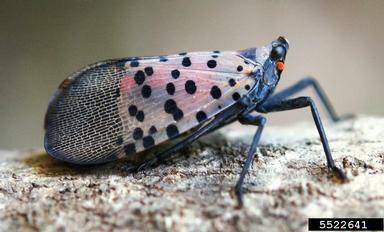 In the insect's current range, its life cycle usually takes one year to complete. Spruce (Picea) is the main host tree. Norway spruce (Picea abies), also a host tree in Europe, and red spruce (P. rubens), a species at risk in most of its range, are the primary host trees in Canada. 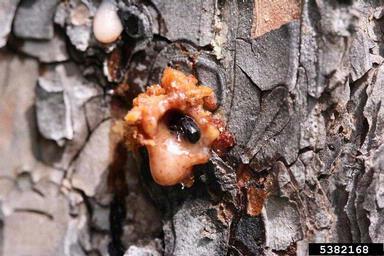 In Europe the beetle is occasionally found in pine (Pinus), fir (Abies) and larch (Larix), so it is possible that BSLB could affect these species in Canada as well, but these trees are at less risk than spruce. BSLB prefers stressed trees to healthy ones, and may also attack dying and recently dead trees. 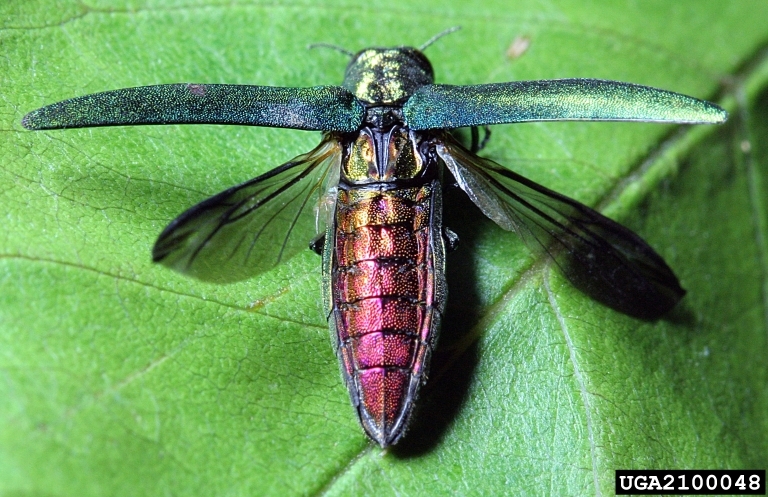 Although the beetle prefers trees >30 cm diameter at breast height (dbh), they will attack those 10 cm dbh or more. 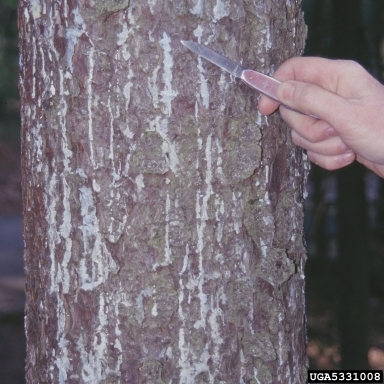 Mature spruce forests, especially those stressed by other insects or drought are especially at risk. Trees can be killed in as little as one year, or may take as long as five years to die. BSLB is established in central Nova Scotia. In 2014 a single beetle was found in Memramcook, New Brunswick, and this area is being surveyed for evidence of more beetles. 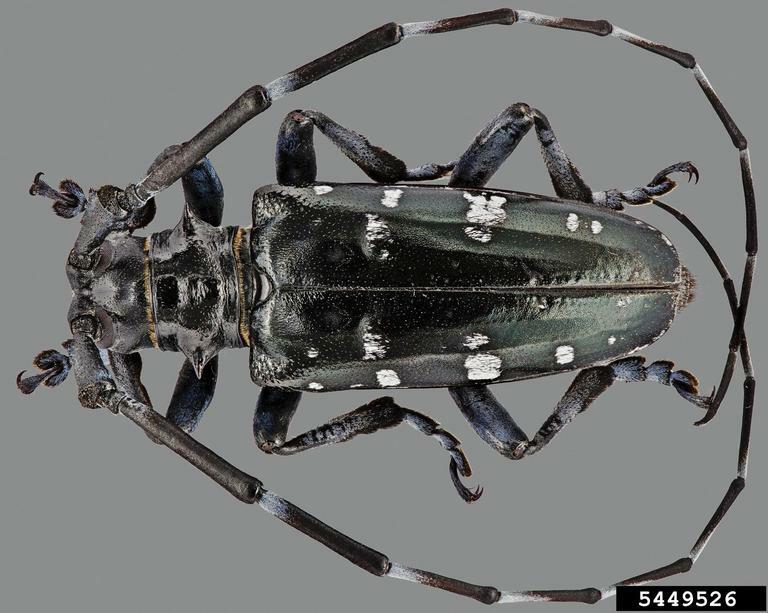 This is the second time a single beetle has been detected in New Brunswick - the first, in 2011, was in Kouchibouquac. Unexplained streams of resin (i.e. 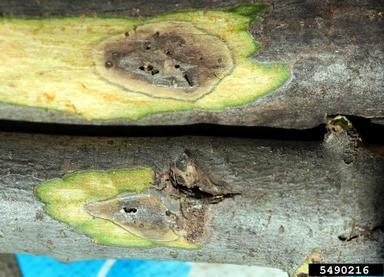 not related to injury), usually copious, may be seen along the trunk of an infested tree. 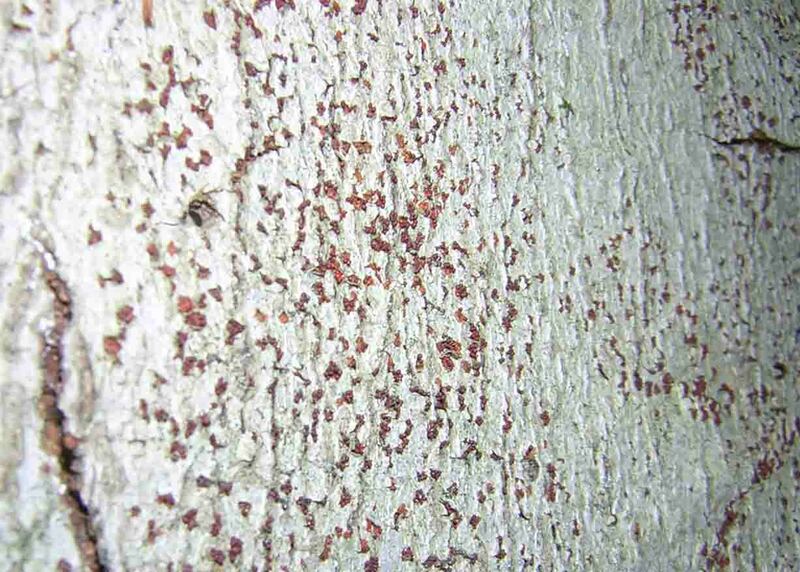 Feeding galleries under the bark, 6 mm across, filled with sawdust-like frass (insect excrement) can be found when bark is peeled back. Exit holes 4-6 mm diameter can be seen in the tree trunk where adult beetles leave the tree. 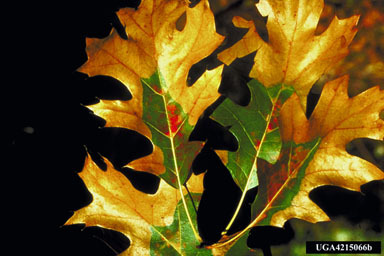 The tree will show general signs of decline, needles yellowing before turning brown and falling from the tree. The adult beetle, which looks slightly flattened, is usually a dark brown colour, with its head and thorax a dark brown or black. It is up to 1.8 cm long, with reddish-brown antennae that are approximately one third of the length of its body. Because of its colouring, it blends in well on the tree's trunk where they hide during the day under scales of bark. Within Nova Scotia contact the Federation of Nova Scotia Woodlot Owners for advice. 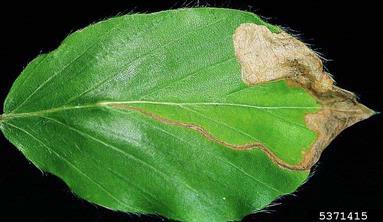 Outside of Nova Scotia contact CFIA Plant Health Surveillance Unit.